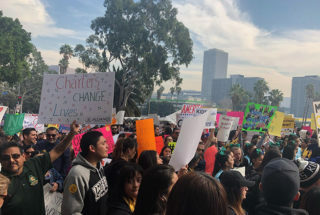 Thousands of charter supporters rally outside the Los Angeles school district headquarters hours before the school board voted for a temporary moratorium on new charters in the district. Hours after about 3,500 charter school supporters rallied at Los Angeles Unified’s headquarters, the school board approved a resolution Tuesday calling for a moratorium on new charters. Only the state can change charter law, so the 5-1 vote directs the district to ask state leaders to study potential changes to the law and to impose a temporary moratorium on new charter schools in the district while the eight- to 10-month study is conducted. A board vote on a moratorium was a key element in last week’s agreement that ended the six-day teacher strike, though it’s not mentioned in the actual contract and there was no guarantee it would pass. The teachers union listed the deal first in its summary of what the agreement had accomplished. That contract won unanimous board approval Tuesday, even though board members had just received a stern warning from their county overseers. Shortly before the meeting, the Los Angeles County Office of Education approved the contract but released a letter stating that it “continues to move the District toward fiscal insolvency” and that its costs — including more than $400 million in new hires and to lower class sizes — are “not sustainable.” It gave the district until March 18 to show how it will make cuts or find new funding, or the county could take over all fiscal decisionmaking. Speaking to the charter resolution, Superintendent Austin Beutner emphasized that it would not impact the district’s existing charter schools. Beutner said at the board meeting and in a statement that he had agreed to the resolution in order to end the strike, that it came up late in the teacher contract negotiations and that it had been introduced by a board member. A day after the contract deal was reached, District 7 board member Richard Vladovic announced he was the resolution’s sponsor. On Tuesday, he stridently defended it, rejecting a suggested amendment by board member Kelly Gonez that offered multiple changes, such as including local representatives and parents in the study on charters. Charters were “never meant to supplant a district, but supplement a district,” Vladovic said. “So I want to step back … and look at the financial impact, the educational impact. Has it made a difference?” Vladovic said he helped write the contract language of the district’s first two charter schools 27 years ago, following state passage of the Charter Schools Act of 1992. Charters are public, nonprofit schools that are privately run. There are currently 225 independent charter schools within L.A. Unified serving more than 112,000 students. L.A. Unified has the most charters of any district in the nation. Ten new charters were approved last year, according to the district. The resolution will now be sent to Gov. Gavin Newsom, the State Board of Education and the California Department of Education. While the resolution doesn’t force the state’s hand, it likely will provide political cover for state leadership, namely Newsom, to pursue restrictions on new charters. The new Democratic governor is union-backed and has said he supports greater transparency measures for charters. The board’s approval of the resolution stood in stark contrast with the throngs of protesters who rallied outside district headquarters hours earlier — some as early as 6 a.m. L.A. Unified School Police said they estimated that about 3,500 people attended the rally. About two dozen parents and community members stayed to speak at the board meeting. Emotions were tense, with some charter parent speakers breaking into tears. One charter school parent was particularly overcome with emotion as she addressed the board. An L.A. Unified graduate, who now has a bachelor’s degree from UCLA, also spoke against the resolution, fondly remembering her charter school in Huntington Park that gave her access to seven AP classes and four SAT practice tests her senior year. Others, however, viewed the resolution as necessary. Julie Regalado, from East Los Angeles, said already existing charters don’t need to leave. But she doesn’t think there needs to be more. Scott Mandell, a teacher at Pacoima Middle School, said, “Dr. Vladovic’s resolution was a central part of the agreement” to end the teachers strike and the board needed to uphold that promise. The resolution was the latest fallout in the battle against charters that engulfed the district during the six-day teacher strike. Charter schools have become a political lightning rod, with United Teachers Los Angeles portraying them as a threat to traditional public schools. The union has labeled charters as “privatization” schemes, purporting that they siphon away money from district public schools and into corporations. While charters are privately run and have more discretion around decisions involving curriculum, the length of the school day and year and hiring and firing, they are public schools and non-profit. They “are open to all children, do not require entrance exams … may not discriminate, may not charge tuition [and] must achieve a racial and ethnic balance reflective of the District population,” according to the district website. They are typically not unionized. *This article has been updated with a new number of charter schools in L.A. Unified and Vladovic’s own amendment to his resolution.